Or how a certain dead-eyed shark gaze was handed down through film history from the forties, to the fifties, to the nineties — I haven’t found the sixties, seventies and noughties versions yet. “One who follows his nature keeps his original nature in the end.” Rita Hayworth’s psycho stare here is clearly an echo of Glenn Anders’ loony gaze earlier when he proposes his crazy murder scheme to Orson on the clifftop. Does the film propose Rita as the source of this madness, transmitted to those in her circle? A gaze-borne mental malady? The greatly underrated Sheryl Lee in TWIN PEAKS: FIRE WALK WITH ME. I still remember the reviews carping that she wasn’t up to playing a leading role, which was grossly unfair as she is ASTONISHING in this film. Again, like Bardot she was discovered and cast for her cuteness, to play a good-looking corpse, and turned out to have so much more going for her. See also: MOTHER NIGHT, WINTER’S BONE… hmmm, those two sound like parts of a series. What would the third film be called? Anyway, the above movies are only touched upon in this week’s edition of The Forgotten, which is about something else. Find out what by going here. This entry was posted on August 18, 2011 at 10:09 am and is filed under FILM with tags Brigitte Bardot, La Femme et le Pantin, Orson Welles, Rita Hayworth, Sheryl Lee, The Daily Notebook, The Forgotten, The Lady from Shanghai, Twin Peaks: Fire Walk With me. You can follow any responses to this entry through the RSS 2.0 feed. You can leave a response, or trackback from your own site. There’s one terrific example in MULHOLLAND DR. It’s a close-up of Naomi Watts just after the lengthy first section. She’s at the film set and she sees Laura Harring making out with the director. Scary. You do see some extraordinary expressions in Lynch’s work generally — partly because he puts great actors into unusual situations, but because, as can be seen in the documentary Lynch, he has a real gift for talking them into a frenzy of excitation. Eye contact depicted on the screen is having powerful impact and if nicely depicted then it can transfer the observer into the world of others with chilling authenticity. Anyway, it its nice to actually write about eye contact in movies as it might be detail within the whole story, but very powerful detail – the story is being told with much more impact if there is use of actors eye contacts (however, it obviously must serve the purpose). These days dead-eye shark gazes are most strongly associated in the U.S. with Republican (ie. neo-fascist) women running for President. And to think that by 1959, Duvivier was considered a despicable-pitiable fossil by La Nouvelle Vague guys. My favorite beautiful dead-eyed female gaze is that of Dana Wynter’s at the end of INVASION OF THE BODY SNATCHERS (56), which sends the hero into an instant hysterical, sweaty frenzy. Sarah Palin et al manage the difficult feat of appearing dead-eyed and mad-eyed at the same time. This is quite late in Duvivier’s career, but he’s far from a spent force. 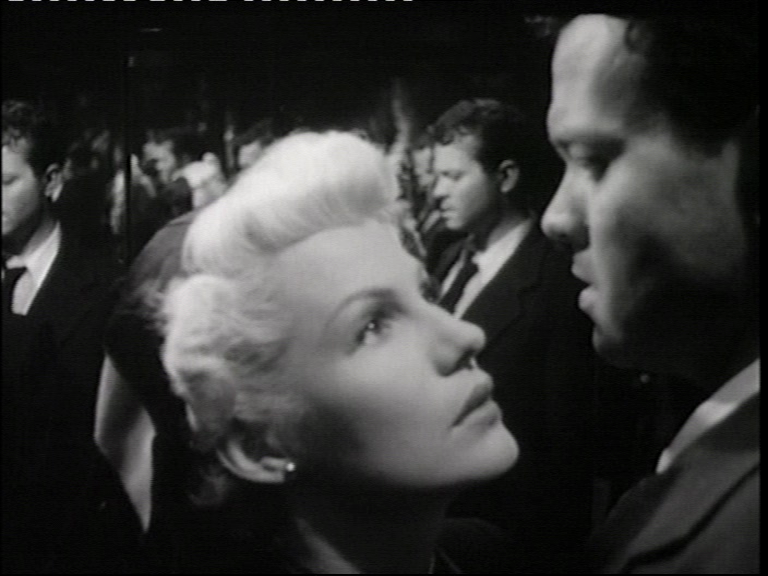 Incidentally, I’m fairly sure Duvivier is thinking of the Welles, but it’s unlikely Lynch is thinking of either. The link is less to do with influence, more to do with synchronicity. Design by Ken Adam… and I’ve never been particularly a Marvin Hamlisch fan, but he does a fine job extending the instrumental break to allow CW to strut his stuff. And to think he started out as a chorus boy for Monique Van Voorhen. “I’m not crying, you fool, I’m laughing!” says Joan Bennett. Kim Newman’s BFI Cat People book is very good, I think, because he really hones in on the film’s seeming assumption that we empathize with the “normal people” which runs in counterpoint to the actuality, which Tourneur seems quite aware of, that we only care about Irena. That slight mismatch between what the words and images tell us provides a good deal of unstated tension. Is it Christopher Walken who started as a chorus boy for the lovely Monique van Vooren? Apparently, Monique was Rudolf Nureyev’s best pal. I wonder if they like to share?